Did you know that the federal government is shortchanging us citizens by a billion dollars a year? Cozy deals with the feds are allowing private enterprise to underpay for natural resources. Last month I wrote about pressuring educational institutions to divest from fossil fuel investments. Our future health and that of the planet depend on using as little carbon-based fuel as possible. Now there is more evidence that divestment is the proper path to follow. A New York Times article examines the most common energy source for generating electricity (coal) and suggests that the public is being cheated. Another article in a scholarly journal looks at atmospheric externalities from five different methods of electrical generation and comes up with estimates of the true cost of each. Any way you look at it, short-term gains by big business are robbing citizens of money and health. Coal on our federal lands belongs to us citizens. Congress set the royalty rate for private companies at about 12% of the sale price for coal strip-mined on federal land. Almost all of that coal is used for generating electricity. Often a small fraction of the price is actually collected, however. The General Accounting Office found that the effective royalty rate was only 5.6% in Colorado in 2012—less than half of what it should have been! Headwaters Economics, a nonpartisan research group, estimates that the loss each year to US citizens is between 1 and 5 billion dollars. Somehow we are being cheated out of this money. But that isn’t the only bad deal that is robbing us of money and health. “Externalities” are hidden costs of a product. In La Plata County 2/3 of our electricity comes from coal-fired power plants. There are many externalities that don’t appear on our La Plata Electric Association bills, including greenhouse gases, mercury and health-robbing particulates. 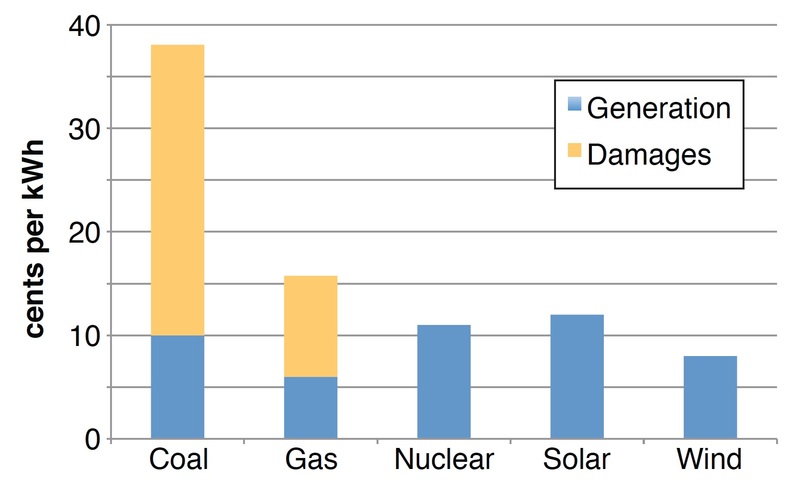 One third of CO2 greenhouse gas emissions in the USA result from electrical generation, but we don’t pay directly for emissions that are causing disasters. Instead, our taxes pay for damage caused by storms and other symptoms of the climate-havoc that CO2 causes. Pregnant women are forbidden from eating many fish because they are contaminated with mercury from burning coal. Some of us pay both with money and with shortened lives for the asthma and other respiratory diseases caused by smokestack particulate emissions. The list of hidden costs goes on and on. What is the true cost of electricity? LPEA charges domestic customers 11.9 cents per kWh—but that is far from the whole cost. (A kilowatt-hour is a measure of electricity.) Professor Shindell at Duke University has attempted to determine the true cost of energy. His paper “The social cost of atmospheric release” looks at two categories of cost—the core cost and externalities. Interestingly, the core costs of wind, solar and nuclear are all about 10 cents/kWh. None of these sources has significant externalities, according to Shindell. This obviously ignores the possible disasters associated with nuclear, however, as demonstrated by the Fukushima Daiichi Nuclear Power Plant. Furthermore, these costs do not include power distribution. According to Shindell, the cost of generation with natural gas is the least expensive at about 6 cents/kWh, but the externalities add another dime of hidden expense. Coal is a loser: its core cost is a dime, but the externalities add another 27 cents to the true cost! That means that the true cost of electricity generated by coal-fired power plants is 37 cents/kWh. Shindell’s study just looked at air pollution externalities. Water, in this year of drought, is another externality. While renewable energy uses little or no water, generation with coal requires a huge amount for cooling. We are lucky to live where forward-thinking LPEA provides our power. Regrettably, more than 2/3 of its power is currently generated by coal. Fortunately it makes renewably generated “Green Power” available for tiny increment in cost. It has programs to encourage energy efficiency, such as paying half the cost of LED light bulbs. It promotes local renewable power generation with wind, hydro and photovoltaic systems, and has encouraged “planting” solar gardens. What can the electrical consumer do? The first step is to use electricity frugally. Turn off lights when you don’t need them, unplug electrical “parasites” that draw current even when they’re “off” and replace your old refrigerator with an Energy Star one. Next, spend a few dollars a year to get “green” power. 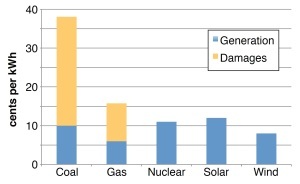 Always keep in mind that electrical generation with coal is robbing us of both money and health. This entry was posted on Monday, April 27th, 2015 at 5:41 am	and is filed under Environment, Greenhouse gases. You can follow any responses to this entry through the RSS 2.0 feed. You can leave a response, or trackback from your own site.